https://houston.bintheredumpthatusa.com/dumpster-rental-atascocita	Bin There Dump That Houston	https://houston.bintheredumpthatusa.com/img/franchisees/54.png	20730 Highland Hollow Lane,, Humble, TX	Contact us for more details. Discover how we make renting a dumpster in Atascocita, TX a simple and easy process. Bin There Dump That is committed to making the dumpster rental process for the customer a seamless transaction, from placing an order for the needed dumpster size to delivery of the waste container in Atascocita to an immediate pick up when you no longer need the bin on your driveway. When do I actually need a dumpster? If you’re second guessing whether or not you need a dumpster, you should consider Bin There Dump That to help make your decision easier. 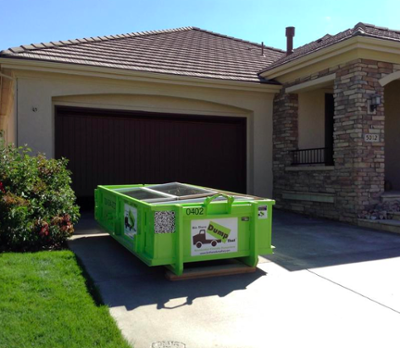 With our world class residential friendly service, we make the process of renting a dumpster quick and easy. All fees for your dumpster rental include delivery and pick up, protection for your driveway and at pick up, we do a full sweep and a full metal sweep to assure that it looks like we were never there to begin with. We ensure only the best of the best service is being provided by Bin There Dump That. Call us now to inquire our Dumpster Consultant about other offers that come when you rent a dumpster with Bin There Dump That. How much does it cost to rent a 20-yard dumpster? Spring cleaning has never been easier than when you have a 20-yard dumpster at your disposal. Perfect for big cleanouts, prices depend on location and materials being disposed of. Call one of our dumpster consultants today for a free quote! This was our first time to use Bin There Dump That. The service was excellent, dumpster was delivered and picked up as scheduled. They were very careful not to damage the driveway. We will definitely use them again. I give Bin There Dump That 5 stars plus, there deliver when they say and always gave me a courtesy call when they were on their way to deliver or pickup. They are priced very affordable and the dumpsters they brought to us were in great shape (no holes or rusted out) And the rear doors opened easily. I now know who to call from now on!! Once again a five star review for the team at Bin There Dump That Houston. Third time renting dumpster from the team and once again excellent service from first call to collection of dumpster. Thank you all! Great experience. Have used Bin There Dump That twice and they are now my go to folks. Great customer service from start to finish. Great experience. The process was easy and they did everything that they say that they do. Will definitely will be using them in the future. Great experience. I wasn't exactly sure on what size bin we needed. We went over all that was going to be thrown in the bin and Marcie couldn't have came any closer on the size dumpster we needed. Everything from the order to the pick up was smooth and effortless !! We had a great experience, competitive pricing, explained everything well, and fast service. Would definitely recommend. Words can not express how amazing the people at Bin There Dump That truly are. The customer service is exceptional!! Marcie, the manager, was so friendly and wonderful when we were in our time of need during Harvey. Ivan, the owner, even surprised us during one of the pick ups when he was training a new driver. Nothing but class with these guys! Highly recommended!! Ivan and Marci at Bin There Dump That are amazing! They answered all of my questions and assisted in determining the appropriate sized dumpster for my needs. They graciously and patiently worked through a serious of unforeseen events. Everyone in the Bin There Dump That Family was professional, courteous, and prompt. The dumpster was delivered and picked up on time, and the driveway was left clean. I will definitely refer friends to Ivan and Marcie. We had a great experience with Bin There Dump That!!! From ordering the dumpster to the pick up, just amazing customer service. We will use this company exclusively. Reliable and quick estimates and service. The driver, Terry, was very friendly and helpful. We give him a big thumbs up! Thank you Marcy & Ivan at Bin There Dump That. Such a great experience. Delivery and Pick Up was on time, and you all were conscientious of being in contact at all times. Needless to say, the service was superlative. Will definitely use you again. Very much appreciate your service. When I contacted Bin There Dump That, they were a very professional service. I was not sure what size dumpster that I needed for my job and through their questions and guidence, they help me pick the size that I needed for my job. When I decided to hire their company, they were very prompt in getting me all the particulars e-mailed to me and I was able to review the contract for the job and sent back the agreement signed with my consent. Once that order of business was conducted, they were very prompt in getting the dumpster to my home and placed in a very strategic location for my job. The driver was a very nice and friendly man and was able to answer some of my questions to my satisfaction. When my job was completed, I called them a day early to pick up the dumpster, they had the same driver come and pick up the dumpster within a couple of hours. After he got the dumpster on his truck, he made sure to sweep up any debris that was there and left my driveway the same way he found it. I would recommend highly their service to anyone that is need of this type of service as far as residental goes. As far as pricing, they were more than fair and in fact, they were somewhat lower in their price then I had previously found. I will certainly keep them in mind the next time I need this type of service. Once again, thanks guys for your prompt and friendly service. This is the first time I’ve rented a dumpster and Bin There Dump made it so easy with renting process and answered my questions. They are the sweetest people you will ever meet!!! I had several people stop by and asked about rental and I gave at least 5 people the information. Thank you so much! Great services, from reservation to delivery to pickup of the dumpster. The receptionist and the driver are exceptionally courteous. Good dumpster and was perfect for the job. The price was a little stiff but worth it. Exceptional service from the first phone call through to collection of the dumpster. Very helpful in discussing and ensuring I had the correct size dumpster for my project and what should and should not be added to the dumpster. Communicated very well on both delivery and collection of dumpster, which were both on time. It is very difficult today to find a company whose goal is to satisfy their customer. They return your call, drop off and pick up when they say they will, stay in touch with their clients, and have an efficient office...almost unheard of today! Thank you very much. Prompt, Professional and Just One Call. Thanks for Going There and Doing That for Me!! Very good service, would highly recommend. Marci was a great coordinator for my needs. The best Dumpster Rental Company I have ever dealt with. Dropped off on time. And picked up in the same fashion. Would recommend this firm to anyone needing Dumpster Service. This company has “IT”; doing business with one call get this done today they will work within YOUR timeframe then you just cross it of that never ending list, l know it will get delivered and l know they will remove when you next call that task is done move on, it’s always that simple that professional . Keep doing what your doing. well done and thanks. Doing business with this company was flawless. Will definitely recommend them to anyone. Dumpster rental made easy! All I had to do was call in my request and Marcie took it from there. The service was outstanding and professional. I would use them over and over again! Great Job! RDA Remodeling and More is very pleased to work with Bin There Dump That! as our prefer Dumpster Service company. We have been working with them for a long time. In each project we complete they are there providing an excellent service. They are reliable, friendly and always on time. We strongly recommend this company for your next project. Thanks team for helping us maintaining our job site clean and safe. Good job! He was right on time, he was very pleasant and had a nice personality. We are very happy for our business with these company and will recommend it to all our friends and family. Always prompt and responsive. I was surprised at how they cleaned up the area around the dumpster before leaving. I recommend them highly. It could not have been easier. One phone call and I had a dumpster. I told them what I was doing and they made the recommendation for dumpster size. PERFECT! I had it leveled. If needed, I'd use them again. Kudos to you all! Outstanding Sevice and Very Professional Team! I’ve been using Bin There Dump That for over 1 year and Marci, Dexter and Tyler have always been friendly, professional and accommodating to our customers needs. Great service. Delivered timely and all communication was great. Really appreciated that they put down a wood base to protect the driveway. Already recommended to several people. I could not have been happier with the entire experience. Every member of the staff were friendly, professional, helpful, knowledgable, and just terrific. The delivery was timely, the dumpster was clean and in great condition, and the pickup was seamless. I will be using them again!! I had two rental house with a lot of trash left in the house. I ordered four dumpster and it makes my life much easier! Great company with great service. I would recommend to anyone! I work for a Construction Company and we have used many dumpster services. Bin There Dump That is by far the BEST company we have ever used. Their prices were excellent but their customer service was even better. We called for 10 yd, it arrived very quickly with great communication from the driver and the Pick up was the same. We will ONLY use BTDT from now on. Also, the doors and flat bottom made loading it ridiculously easy. Thank you for a smooth, easy experience! Seriously I don't think we could be any happier with this company! Marci was the sweetest, they were able to help us in a very short, specific time frame and the delivery and pick up people could not have been any more professional!!! HOMERUN!! Great customer service. Always willing to do whatever they can to make it easy for us! Great service. Everyone is so friendly and helpful! Great Service at a Great Price!! Thank You for a job well done! Fantastic service. Very easy to work with and awesome pricing. Thank you for all of your help through our Hurricane Harvey clean up! I have used many companies such as this one over the years, l have to say it was beyond my expections from start to finish,”doing business the old fashioned way”, what they say is exactly what they do. Great job to you and all ,a job well done. Thank you, J Kays. I’ve used BTDT about 10 times now and the service is just as amazing as it was the first time. I’ll continue to explicitly use their service! I’ve used them twice now and wonderful service both times. Always in contact on delivery and pick up with immediate response to any questions. I have and will recommend them again. Marcy hooked me up with price and availability and promised a bin for next day delivery. As promised bin arrived next morning and delivery driver was courteous and careful. Filled bin that day called that afternoon and bin was picked up 10am next day. A 24 hour turnaround. These guys are REAL PROFESSIONALS!!! Excellent customer service! Very pleased with delivery and pick up - this company delivers on promises. We continue to use them for all our dumpster needs and highly recommend them to anyone. Great customer service. Delivery and pick-up is the greatest, on time and they clean up the area when they pick up. Have used them for over a year on different projects in the area. Excellent customer service, delivery was on time and very courteous. Pick-up was great, driver was very courteous and efficient. Will be using the service again and will recommend them to anyone. We called other companies but Marcy was extremely helpful, the prices were very reasonable and the pick up and delvery of the dumpster were on time. Will use them again and highly recommend them to my friends and clients. This company provides excellent customer service. We finished our kitchen demo post Harvey and this was a great choice for us. I called them on Friday, they dropped the dumpster the next morning. I highly recommend them. Easy to work with, everything on time and as planned. Extremely pleased with the quality, price and service. Will use them again on my next project. This company is unbelievable when it comes to customer service. I wish I could give them more than 5 stars. I highly recommend them if you need their dumpster service. Ivan was very prompt on delivery and pickup. Thank you Ivan for making our move even easier!!! We called two other Dumpster rentals before we tried Ivan and we are so glad that the others did not meet our needs. Ivan is professional,respectful and so very pleasant to deal with. They were on time both for drop off and pick up. Their containers were in great shape and served our needs perfectly. They have earned a loyal customer with us! Thank you for making our job easier! Awesome experience-very professional people (all of them) when I need to dump items again, this company WILL be the first and ONLY ones I’ll call. Great job by company. From arranging to driver to email communications all was well done. Next time I need a dumpster it will be Bin There Dump That. Great pricing customer service. Highly recommend. Marcie is the Bomb. After living in the same house in Spring,Texas for over 46 years we are moving to Rockport, Texas. As you can imagine we had accumulated a lot of junk. I went online (Google) and located a company with a unusual name, Bin There Dump That. I called them and talked to a pleasant receptionist. She gave me the prices for the various size dumpsters. I called several other companies without as pleasant a conversation. I decided to use Bin There Dump That. They delivered my bin and picket it up as we had agreed. A very pleasant transition and I plan to call them back closer to closing and moving. Situated on the northeast shore of Lake Houston, Atascocita is a little town with a lot to offer. With so much to do in Atascocita and nearby Houston don’t waste your time working with unreliable dumpster rental services. Residential dumpster rental should be easy. The best dumpster rental company in town protects your driveway from scuffs and makes the trip to the dump for you. The Jesse Jones Park looks like something out of a fantasy movie. Follow the bridge through the pristine flood plains and admire the beautiful old world cypress trees. The white sand beaches along the creek are perfect for long walks over the weekend. The Spring Creek Greenway has over 16 miles of paved trails and over 8 miles of rugged unpaved trails. Love to fish? Sheldon Lake is one of the best fishing holes in Texas. Fish from the docks or rent a boat for the day. The self-guided nature trail goes by 28 natural ponds, home to alligators, exotic birds, and tons of other wildlife. The John Jacob Observation Tower gives visitors unparalleled panoramic views of the lake and downtown Houston. Originally designated as Lake Sheldon’s replacement as Houston’s main water source, Lake Houston is now a local favorite for fishing and other recreational activities. The lake is regularly stocked with fish and the northern end hosts campsites and hiking trails. Your local Dumpster Rental Atascocita dumpster rental operators are Ivan & Michelle And Tony & Sylvia.